This article was derived and adapted with permission from ECFA’s article “California Court Upholds Attorney General’s Demand for Donor Information” in its October 2018 issue of the Nonprofit Pulse. As reported in ECFA’s October 2018 edition of Nonprofit Pulse, the California Ninth Circuit Court of Appeals recently affirmed the position of the California Attorney General stating that charities located or doing business in California must provide a copy of their un-redacted Form 990 Schedule B with their annual report filed with the Attorney General. The information required to be submitted includes the names, addresses, and amounts of contributions for all donors that are required by the IRS to be reported on Schedule B. This ruling raises concerns about donor privacy even though the Attorney General has asserted that the information will not be made public. Another recent legal development addresses a similar requirement in the state of New York. So what do these rulings mean for nonprofits doing business, soliciting contributions, or holding assets in California or New York? Tax-exempt organizations meeting certain criteria that file Form 990 (the major informational return) with the Internal Revenue Service are required to include in the return Schedule B, which discloses the identities of certain donors who have given large contributions to the organization, together with their addresses and the amounts they gave. The Form 990, once filed with the IRS, is required to be made available for public inspection by the filing organization and the IRS releases copies of the Form 990, which are generally made publicly available on the website GuideStar.org. The public inspection copies of Form 990 are not required to include the identities (or identifying information) of the donors, but the amounts reported on Schedule B are required to be disclosed. The IRS redacts donor identity information from the copies of Form 990 that are released and made available on the GuideStar website. In California, the Attorney General’s Registry of Charitable Trusts (“Registry”) regulates charities and other nonprofit organizations by administering certain registration and reporting requirements. Generally, nonprofit organizations must register with the Registry within 30 days of first receiving a donation or assets with financial value for charitable purposes. This initial registration reporting package includes a state Form CT-1, a copy of the nonprofit’s tax exemption application, a copy of the nonprofit’s IRS determination letter, and copies of the organization’s founding documents. Additionally, nonprofits generally must comply with annual reporting requirements in the form of registration renewals (i.e., Annual Registration Renewal Fee Report, Form RRF-1). When filing a Form RRF-1, charitable organizations are required to file a copy of their annual IRS Form 990, Form 990-EZ, or Form 990-PF informational return. The Attorney General maintains that all schedules to these forms filed with the IRS must also be filed with the Registry, including Schedule B. Having officers or employees who perform work in California. Religious corporations (as defined by the California Secretary of State) are automatically exempt from registration and reporting with the Registry. Additionally, the Guide indicates that the Registry typically exempts any foreign (i.e., non-California) religious corporation that holds property for religious purposes and operates primarily as a religious organization. The Guide further indicates that “if a religious organization outside California has a broad purpose statement and dissolution clause, or the purpose statement includes a non-religious purpose (e.g., to build schools internationally, feed the hungry, or shelter the homeless), the organization might not be exempt as a religious organization.” The Registry evaluates claims of religious exemption by foreign corporations on a case-by-case basis. Other specific exemptions from registration and reporting requirements exist for other types of organizations. Additionally, California’s Charitable Solicitation Law contains additional reporting requirements for charitable organizations. A nonprofit organization should consult with legal counsel regarding applicability of the California reporting requirements to a specific organization. As noted above, California requires nonprofit organizations to submit a full copy of its Form 990, Form 990-EZ, or Form 990-PF informational returns to the Attorney General’s office annually, and specifically requires that the returns include copies of all Schedules, including Schedule B. In recent years, the requirement to file Schedule B with the IRS Form 990 has created controversy. 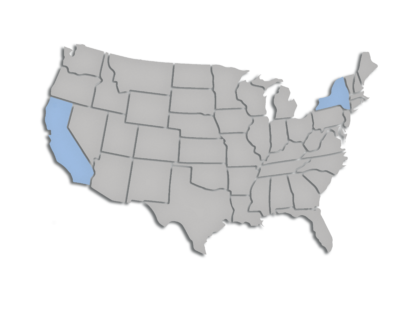 Both California and New York have previously required an un-redacted copy of Schedule B if a charity wanted to solicit contributions in the state (both states have also indicated that it is not their policy to disclose the information in Schedule B to the public). Courts have generally ruled in favor of the states. For example, in February 2018, the Court of Appeals for the Second Circuit affirmed a district court’s decision that New York State’s requirement that registered charities disclose the identity of their donors did not violate the First Amendment and that the requirement was not preempted by federal tax laws. However, in Americans for Prosperity Foundation v. Becerra and Thomas More Law Center v. Becerra, the California Attorney General’s collection of Schedule B information was successfully challenged in Federal District Court based on the arguments that the confidential disclosure to the California Attorney General itself chills protected conduct and/or would lead to persecution and harassment of the nonprofit’s donors by the state or the public. Thus, the Ninth Circuit Court of Appeals decision and the Second Circuit Court of Appeals decision earlier this year, both affirm states’ rights to request un-redacted copies of Schedule B in connection with state registration and reporting requirements. Nonprofit organizations should consult with their legal counsel and ensure that the organization is in compliance with California, New York, and other state reporting requirements, including the requirement in some states to submit a full copy of the Form 990.